AdventureX 2018 was the eighth annual convention in London focusing on point-and-click adventures and narrative-driven games. It was the biggest expo to date, with the Kickstarter reaching full funding in two days and over 400 people attending the sell-out weekend. Guest speakers included Dave Gilbert (Wadjet Eye, The Blackwell series), Ragnar Tørnquist (Red Thread Games, The Longest Journey series), and Jon Ingold (inkle, 80 Days). There were also over twenty indie developers and studios demoing their games, and Jump Dash Roll had hands-on play time with some very exciting titles. Here are some of our thoughts! Cambridge-based studio Polygon Treehouse has created a point-and-click set in the icy Scandinavian wilderness. Tove is a teenage girl living with her young brother Lars and alcoholic father Henrik in a wooden hut in the tundra. One evening they are attacked in their home by a yeti-like creature which scoops up Lars, setting the scene for a tale of familial reconciliation where the feels are suitably amped up. The hand-drawn visuals are lovely, Tove's animations in particular feel natural as she weighs a stone in her hand before using it to scare off birds. The puzzles at the start are typically untaxing as the game introduces you to its interface but we expect that the difficulty will increase later on in the game. Röki is shaping up to be a fabulous blend of mythology and point-and-click goodness, with a target release date on PC of mid-late 2019 and console hopefully following later. If you ever wondered what 80 Days would be like if you were on the run from a Nazi spycatcher, Over the Alps has you covered. 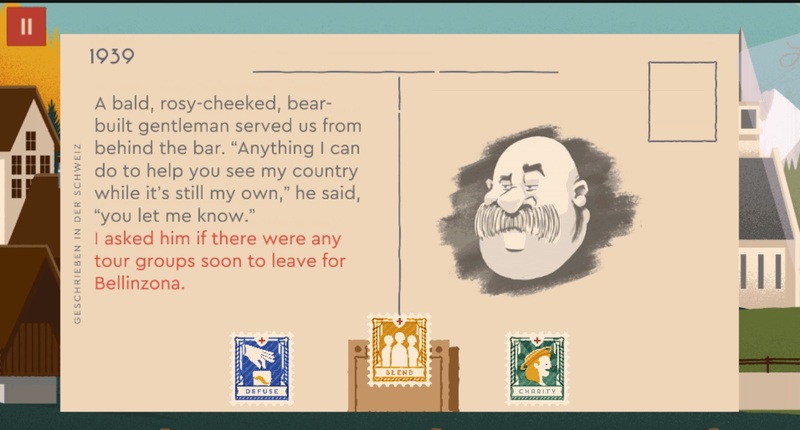 A text-based branching narrative weaves through a 1939 setting while evocative postcards and stamps provide the canvas and choice mechanics for you to keep your undercover protagonist out of the clutches of evil. The story is told in retrospect with the decisions you make on how to handle each situation opening up different routes through the game. A more cautious player may want to defuse every fraught situation, others may want to take a more wilful approach. Similarly, a charitable spy might find otherwise locked doors open to them... unless they lead to a trap. Choosing a consistent path might unlock further similar options later on down the line, though the end result might not be what you expect. The job of thwarting the Nazis can be done in numerous ways, but at what cost? Stave Studios' first game is already at an exceptionally polished level, with only bells and whistles left to add to the interface to really make the evocative trek through Switzerland shine. We'll be looking out for this when it launches next year. The Darkside Detective was a police procedural married to Twin Peaks with a healthy dose of Irish humour and it utterly passed us by upon release. This was rectified at AdventureX where developer Spooky Doorway were showcasing both their first game and its follow-up which is due out early next year. Detective McQueen and Officer Dooley are sent to investigate a number of supernatural cases which inevitably led to crazy characters, sardonic wit, a healthy dose of farce, and humour that managed to be hysterically funny despite its occasionally obvious cues. The stripped-down locations mean that puzzles are played more for laughs than any real cerebral challenge, but half the fun is clicking around and seeing what descriptive gems the writers have left for you to discover. The Darkside Detective is what we'd expect to see if Father Ted replaced Mulder in The X-Files and it looks like the second season is going to offer up more of the same. In our opinion, that's no bad thing at all. AdventureX also had a number of smaller games and titles which are already released. Freya Campbell's Perseids is a touching interactive narrative about four people on a road trip to catch a glimpse of a meteor shower, created for a game jam with lovely music composed by the author. Blood Money by Hannah Powell-Smith is a more intense affair, a supernatural tale with a Choose Your Own Adventure feel to the always excellent writing. 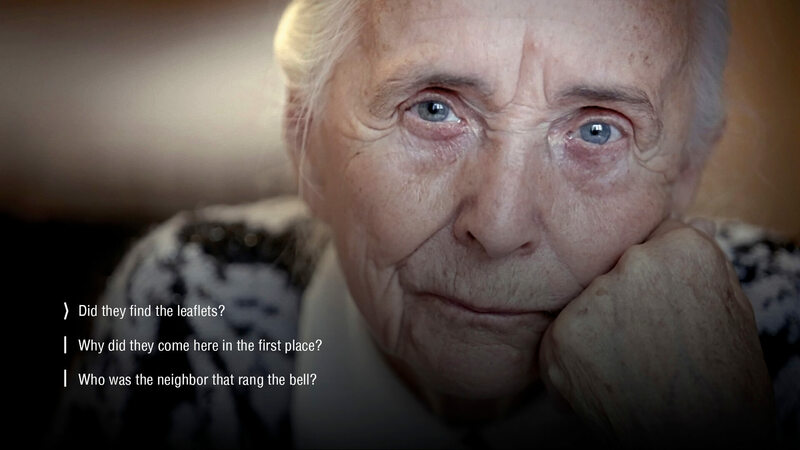 Taking a more educational approach to interactive storytelling, Attentat 1942 is a game which blends live-action footage with a unique black-and-white sketched game aesthetic. It focuses on the Nazi occupation of Czechoslovakia with stories told from the perspective of the survivors, and it's an excellent demonstration of how games can be used to teach history in a more interactive style. 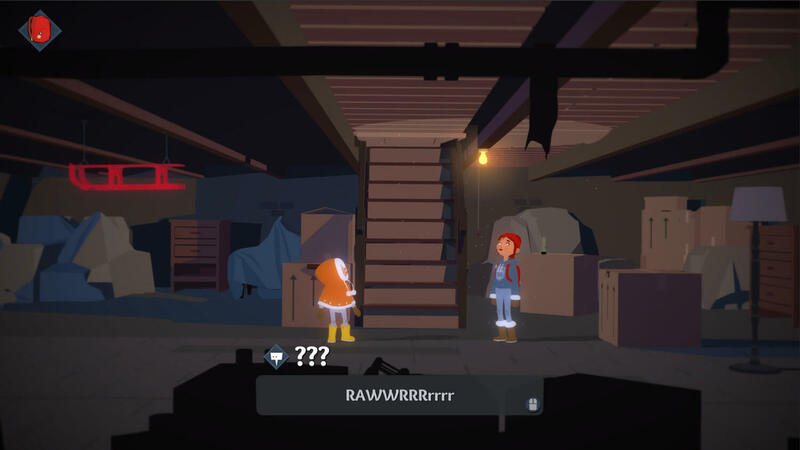 Not Tonight is a satirical take on Brexit with similar gaming mechanics to Papers, Please where you're cast as a European doorman in a post-Brexit Britain, struggling to get enough cash together to stay in the country. Checking IDs against a guest list and ensuring no-one underage gets in is your night job, but things take a more sinister turn as right-wing elements conspire against you. Finally, the Bitsy Boutique brought together hundreds of games created in pixel-programming editor Bitsy.